Oh no! 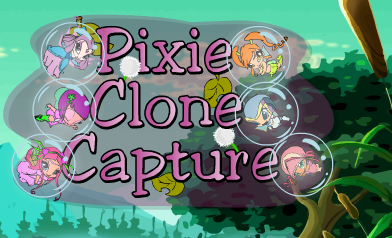 professor Wizgiz's magical multiplier has gone crazy and multiplied all the pixies! Plus they're under the powerful home sickness spell cast by Lord Darkar! Catch the pixies before they can escape and lead Lord Darkar to another piece of the codex! Ms. Garagonda has loaned you her magic wand in order to capture the pixie clones! It's up to you to resolve this dreadful tragedy! Click, drag and release to create a magical shield around the pixies. Capture hourglasses to gain more time and gems to increase your magical power. Work quickly! You only have a short time to catch as many as you can!